It’s no surprise that 2016 is being called “The Year of Video Marketing“. Why do people connect to video so much? According to data detailed in this HubSpot roundup, the brain processes visual information 60,000 times faster than text. Images speak volumes, but videos have the ability to create a multi-dimensional experience, ensuring that your brand is no longer perceived as simply a company, but rather as a personality or an experience. Podcasts also continue to explode in popularity as well, with over 60,000 different podcasts now available on iTunes and over 17% of Americans listening to podcasts monthly. Since it is now easier than ever to consume podcasts (via apple’s app and others for every mobile device), these numbers are only expected to grow. We are excited to see so many advisors starting to include different forms of multimedia in their websites and online marketing (in the form of welcome messages, podcasts and vlogs – video blogs), but we know that it can feel overwhelming to get started. You might be wonder what tools you need to create this content, how to ensure your video or sound quality is professional, what camera to use, and other similar questions when working on your financial advisor website. Twenty Over Ten recently partnered with Bill Winterberg of FPPad to highlight the best tools and resources Financial Advisors can use to create content for their websites (specifically video and audio gear). As part of this series, we’ll also later be posting detailed how-to’s that you can use to implement some of these strategies in your own firm. 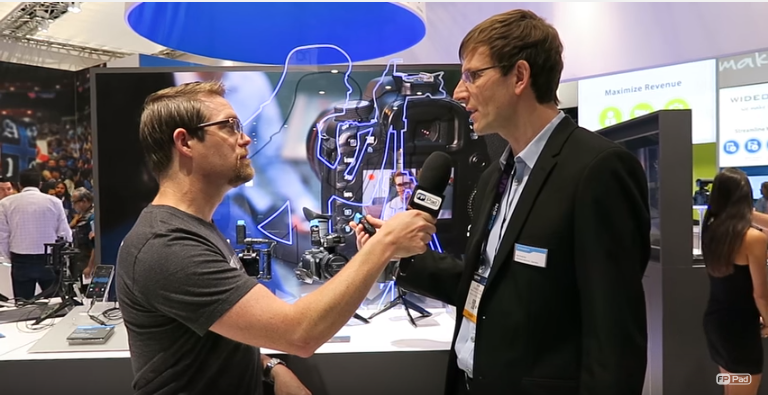 In these videos, Bill highlights the best gear and resources now available to advisors from the 2016 NAB Show. We will be sharing some of these videos and our top take-aways from each in our own blog series “Best Content Creation Gear for Financial Advisors” (This being the first post!). We hope this series will better equip advisors to to tell their story with online video content. How to Include Professional Audio to Accompany your Video Content. In the past, it has been difficult to obtain strong and professional audio to accompany video content. However, there is now an easy plug and play solution for high quality audio with the Sennheiser AVX digital wireless camera microphone system. The system is self-configuring and is iPhone compatible. All you have to do is turn it on and you are ready to go! Be sure to check out this first video in our series featuring Bill Winterberg below. Be on the lookout for Part 2 of the Best Content Creation Gear for Financial Advisors series featuring two incredible types of camcorders! You can also check out these other Twenty Over Ten blog posts: How Can Financial Advisors Attract New Business? and Blogging for Financial Advisors 101: Blogging Basics.